Lucie deLaBruere from St. Albans City School in rural Vermont. 11:00am Tuesday. Lucie also contributes to Infinite Thinking Machine. Furl for research: it can export formatted Works Cited pages. Lucie’s notes are available online at PBWiki. Firefox has a delicious search utility (see image at right), which can make the search faster. I tried googling the term first, didn’t find what I wanted, then switched the search engine right there in Firefox — no retyping. Pay attention to the other tags beneath the name of any search result. 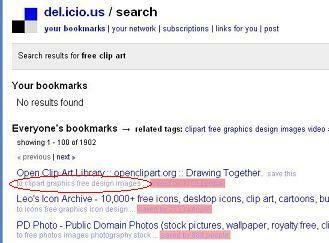 For example, in the search for free clip art, the first result has also been tagged as “graphics” and “design”. Look for people who tag things like you! Have a single class of students find and post to one del.icio.us account. This is how you can send them off to “do research”. The goal is to post relevant pages to the del.icio.us account. An interesting little side effect: a page can be posted only once to a del.icio.us account. The first kid to tag it wins. Highlighted text on a page automatically becomes the description text. Let’s imagine you’ve got kids searching for information on alcohol abuse. Send them off on the web to search. When they tag, ask them to add their screenname to the tags they choose to add. I might tag something “pregnancy alcohol abuse megan”. When you as a teacher go back in del.icio.us, you can “grade papers” online. Hit a kid’s tag and see everything he/she tagged. Lucie was an excellent presenter who moved at a great pace for me. I’d definitely hear her speak again. Thanks Megan! I look forward to hearing how others use this information.